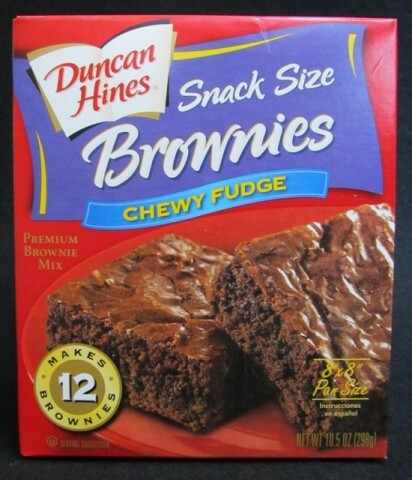 What’s Bueno at the 99¢ Only Store: Duncan Hines Snack Size Brownies! AS YOU KNOW, I’ve been shopping at the 99¢ Only store since back when you and everyone else made fun of me for shopping at the 99¢ Only store. And also because my pants only came down to about three inches above my ankles. That’s the disadvantage of hand-me-downs and having an older sister who’s so short. Yeah, you’re fooling no one, especially since you’ve got a shopping cart full of cheap Argentinian breakfast cereal and White Rain shampoo. But then, so does she, plus she’s got a package of Julie maxipads. Believe me, brother, or in this case, sister, you’ve got the upper hand here; she’s telling no one who she saw slumming it. Oh yes! Here’s the thing: The 99¢ Only store is a game-changer now. What does that mean? Well, really, it’s just a hyphenated buzzword that you can plug in just about anywhere, and everyone does, but what I mean specifically is that Big Food finally realized that normal people, people like you and I, have begun shopping at the 99¢ Only store, sure. The 99¢ Only store: It’s not just for poor people anymore!™ So they realized this, and what they’ve started to do, see, is package their products in smaller sizes so they can be sold for a buck! Which pisses you and me off because we’re really not getting the deals we used to, but, aah, whaddayagonnado, right? …Well, at least I’m not getting the deals I used to, because I shopped here before you did, back before it was “cool.” Before the 99¢ Only store sold out, man. So about these Duncan Hines Snack Size Brownies, Chewy Fudge variety: “Makes 12 Brownies” the box says. Okay, that’s my first problem. Technically, it makes one big brownie. But it’s a smaller one big brownie than if you bought a box at your regular grocery store. See, that’s what they’re doing – they know people like you are shopping at the 99¢ Only store now, so while you may not bother picking up a box of brownie mix at A&P or Grand Union or your precious “Wegmans” because it’s too expensive, you see it at the 99¢ Only store, and like idiots, like sheep, you decide “Ooh, boy! Brownie mix – name brand brownie mix! – here at the 99¢ Only store! I’ll pick up a box here and really stick it to the man!” Like idiots you people do this, not realizing they’ve shrunken the package down specifically for the 99¢ Only store. You’re not saving a dime! Anyway, I know a bargain when I see one so I snatched this thing up right away! Jesus, this is Duncan Hines brownie mix! This isn’t some off-brand crap! This is the real deal! And for a buck?! Of course I bought it! 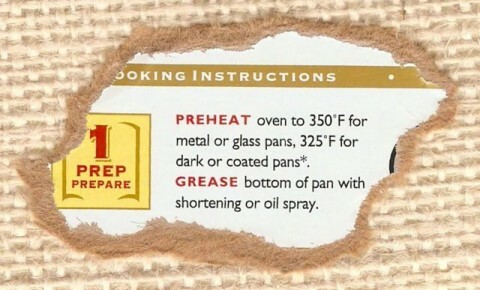 Okay, do you see that asterisk after “coated pans”…? Yeah, well, there’s no corresponding asterisk, no footnote, if you will, ANYWHERE ELSE ON THE PACKAGE! 325˚F for dark or coated pans…and then what?! I defy you to locate another asterisk on the entire box! You won’t find one – not even on the Spanish side! We’re left hanging, you and I. There’s evidently something they wanted us to be aware of, but then the goddamn technical writer who comes up with the copy for these boxes decided “Hell with it, lunch time! Buffalo Wild Wings? I’m in!” and that was that. He never got back to it – and pity the poor Spanish-only readers, who didn’t even know about this asterisktastrophe! Or maybe they were the lucky ones – unable (or unwilling) to read English, they were never faced with the anxiety, the disquietude, even, of a dangling asterisk. Well, as it happened, I used a coated pan and my one big brownie turned out great. Hell, it’s a brownie – how can it not be great, right? (Though it wasn’t nearly as thick as they appear on the package.) I was going to call Duncan Hines’ toll-free number and find out what was supposed to be on the other side of that missing asterisk, but my phone bill’s high enough as it is. Posted by Ted on November 15, 2011, 6:00 AM.